This article is about Decatur, county seat of DeKalb County. 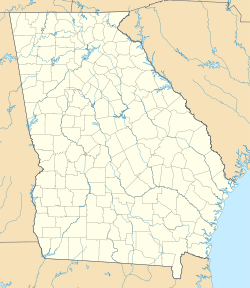 For the county also located in the U.S. state of Georgia, see Decatur County, Georgia. "A City of Homes, Schools and Places of Worship"
Decatur was established at the intersection of two Native American trails: the Sandtown, which led east from the Chattahoochee River at Utoy Creek, and the Shallowford, which follows today's Clairmont Road, and eventually crossed near Roswell. It was named for United States Navy Commodore Stephen Decatur. Shallowford Road, which led to the Shallow Ford, has been renamed Clairmont Avenue, probably because it does not go to, from or past any place called Clairmont. Covington Road is now Sycamore Street, probably because it leads to Covington and has no Sycamores on it. Nelson's Ferry Road, named after the local family which ran the ferry at the Chattahoochee end of the road, has been named Ponce de Leon after a family prominent, before Castro, in Havana, Cuba. During the American Civil War, Decatur became a strategic site in Sherman's Atlanta Campaign. In July 1864, Major-General James McPherson occupied the town to cut off the Confederates' supply line from Augusta. On July 22, during the Battle of Atlanta, Confederate cavalry under Major-General Joseph Wheeler attacked McPherson's supply wagons and the Union troops left to defend the wagons. A historical marker at the old courthouse marks the site of this skirmish. We attacked Decatur on the 22d and took the town driving out a Brigade of Infantry and a good deal of Dismounted Cavalry. Our Brigade really took the town, tho' it was supported on both flanks by a Brigade of Cavalry dismounted. The fight lasted about two hours and was very hot for a while. The Yankees had the hills and houses on us and fought very well for a time. Our dash was made to distract attention while Hardee made the real attack on the enemy's flank. We captured over a hundred prisoners and killed and wounded about one hundred and fifty. Our loss about seventy killed and wounded. 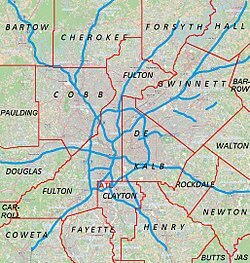 In the last half of the twentieth century the metropolitan area of Atlanta expanded into unincorporated DeKalb County, eventually surrounding two sides of the town of Decatur. Concurrently many well-to-do and middle class white Americans fled the area to more distant suburbs. The 1960s and 1970s witnessed dramatic drops in property values. However, more recently the city has regained economic vigor, partially thanks to several long-term downtown development plans that have come to fruition, making Decatur a trendy small mixed-use district with easy transit to downtown Atlanta. Over the past twenty years, it has gained a local and national reputation as a progressive city with a high level of citizen involvement that retains a small town feel despite its proximity to Atlanta. Decatur is located at 33°46′17″N 84°17′52″W﻿ / ﻿33.77139°N 84.29778°W﻿ / 33.77139; -84.29778 (33.771355, -84.297732). 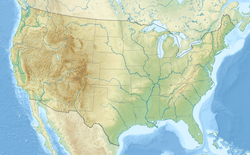 According to the United States Census Bureau, the city has a total area of 4.2 square miles (11 km2), all land. The Eastern Continental Divide bisects the city along the CSX (formerly Georgia Railroad) trackage right of way. As of the 2010 census, there were 19,335 people, 8,599 occupied housing units, and 4,215 families residing in the city. The population density was 4,603.6 people per square mile (2,860.2/km²). There were 9,335 housing units at an average density of 2,222.6 per square mile (1,380.9/km²). The racial makeup of the city was 73.5% White, 20.2% African American, 0.2% Native American, 2.9% Asian, 0.0% Pacific Islander, 0.6% from other races, and 2.4% from two or more races. Hispanic or Latino of any race were 3.2% of the population. There were 2,541 (29.5%) households which had children under the age of 18 living with them, 3,336 (38.8%) were a Husband-Wife family living together, 984 (11.4%) of households had a female householder with no husband present, and 4,063 (47.2%) did not fit into either of the two previously mentioned categories. 3,263 (37.9%) of all households were made up of individuals of those, 1,814 (21.1%) had someone living alone who was 65 years of age or older. The average household size was 2.17 and the average family size was 2.96. In the city, the population was spread out with 25.1% under the age of 19, 5.2% from 20 to 24, 32.9% from 25 to 44, 25.7% from 45 to 64, and 11.1% who were 65 years of age or older. The median age was 38 years. There are roughly 44 males for every 56 females. The median income for a household in the city was $73,602. Males had a median income of $73,089 versus $58,580 for females. The per capita income for the city was $42,926. About 12.20% of families and 14.9% of the population were below the poverty line, including 24.2% of those under age 18 and 12.5% of those age 65 or over. Education levels for Decatur are above average for the Atlanta area, with 56% of residents having obtained a bachelor's degree or higher, and 27% having obtained a graduate degree or higher. The Decatur City School District, which serves the city limits, holds pre-school to grade twelve, and consists of a pre-K early childhood learning center, five elementary schools, a fourth and fifth grade academy, a middle school, and a high school. The Decatur City School District was the highest performing school district in Georgia on the SATs for the 2014-2015 school year. The DeKalb County School District, which serves unincorporated areas in DeKalb County around Decatur, operates the William Bradley Bryant Center (WBBC) in an unincorporated area near Decatur. College Heights Early Childhood Learning Center. The Decatur City district has 224 full-time teachers and over 4,400 students from pre-K through grade 12. DeKalb County Public Library operates the Decatur Branch and is also the Dekalb County Library Headquarters. Decatur has operated under a Commission-Manager form of government since 1920. The Charter of the City of Decatur establishes the City Commission as the governing and legislative authority of the City government. A five-member City Commission is elected for four-year terms on two-year cycles. Two members are elected from the south side of the city, two from the north side and one is elected at-large. At their organizational meeting each January, the Commissioners elect a mayor and mayor-pro-tem from among their own membership for a one-year term. The mayor is not a separate elected office. The current mayor is Patti Garrett. Previous mayors have included Leslie Jasper Steele (1915), Jack Hamilton, Walter Drake, Mike Mears, Ann A. Crichton, Elizabeth Wilson, William Floyd, Jim Baskett and Scott Candler, Sr. (known as Mr. DeKalb). The Commission appoints a professional City Manager to carry out the policies, directives and day-to-day business of the city. There are also several citizen volunteer boards and commissions appointed by the City Commission, including the Planning Commission, the Zoning Board of Appeals, and the Historic Preservation Commission. The Georgia Department of Juvenile Justice has its headquarters in Avondale Estates, near Decatur. The Georgia Bureau of Investigation has its headquarters near Decatur, in an unincorporated area. The United States Postal Service operates the Decatur Post Office. Decatur is home to Eddie's Attic, which is a live music venue hosting shows almost every night. Decatur is known for its frequent festivals, which include the annual Decatur Arts Festival, Summer In The City, Decatur BBQ, Blues & Bluegrass Festival, the Decatur Book Festival, the Decatur Maker's Faire, The Decatur Craft Beer Festival and the Decatur Wine Festival. Other events throughout the year include parades, Concerts on the Square, wine crawls, art walks, runs, and races. Decatur is known for its food scene and was named one of the South's "Tastiest Towns" in 2012. In 2016, the New York Times called it "Atlanta's gastronomic equivalent of Berkeley or Brooklyn". Decatur has a growing beer scene with the award-winning Brick Store Pub, Wild Heaven Beer, Three Taverns Brewery, and Blue Tarp Brewing Co. The Decatur Craft Beer Festival was named one of the top ten beer festivals in the United States. Decatur is also home to Independent Distilling Co.
Decatur's downtown area and residential neighborhoods are filled with historic structures and sites of interest. This list primarily consists of structures on the National Register of Historic Places, but many remain privately owned and may only be viewed from the exterior. South Candler Street-Agnes Scott College Historic District, 141 East College Avenue. This district is on the National Register of Historic Places. It includes both the college campus and surrounding historic homes, and is book-ended by the Winnona Park Historic District to the east and the MAK Historic District to the west. Columbia Theological Seminary, 701 Columbia Drive. This tree-lined, brick and limestone campus lies within Decatur's Winnona Park neighborhood. Cora Beck Hampton Schoolhouse and House, 213 Hillyer Place. These structures are on the National Register of Historic Places. Decatur Cemetery, 229 Bell Street. This historic cemetery was founded in the early 19th century and is located northeast of Decatur Square. Decatur Railway Depot, 301 East Howard Street. Decatur's renovated depot is now a restaurant known as Kimball House. Old DeKalb County Courthouse, 101 East Court Square. 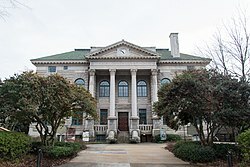 The historic courthouse sits in Decatur Square, and contains a small history museum. Fraser House, Church Street and Bell Street. This modest 19th-century structure stands at the entrance to Decatur Cemetery. High House, North Candler Street and Sycamore Street. This antebellum structure is believed to be the oldest two-story structure in Decatur. Historic House Complex, 716 and 720 West Trinity Place. Three antebellum homes relocated to Adair Park. Historic Oakhurst, in southwest Decatur. An early 20th century town annexed by Decatur, Oakhurst still has its own business district surrounded by bungalows. MAK Historic District, McDonough, Adams and Kings Highway. Decatur's first local historic district is full of early 20th century American Craftsman-style homes and has been used by Hollywood for films. Methodist Chapel, Commerce Avenue and Sycamore Street. A beautiful granite chapel on historic Sycamore Street that is owned by Decatur First United Methodist Church. Old Scottish Rite Hospital, 321 West Hill Street (Oakhurst neighborhood). The historic Shriners' hospital has had an adaptive reuse and now houses restaurants and an art gallery. Pythagoras Masonic Lodge, 108 East Ponce de Leon Avenue. A 1924 building designed by architect William Sayward. Ponce de Leon Court Historic District. A single street of bungalows and palm trees east of Decatur Square (off Ponce de Leon Avenue). Historic Sycamore Street, Some of Decatur's largest historic residences line this street. Old U.S. Post Office, 141 Trinity Place. This marble-encased former federal building is on the National Register of Historic Places. Winnona Park Historic District, in southeast Decatur. This district is on the National Register of Historic Places for its residences and is also the home of Columbia Theological Seminary. Woodlands Garden, 932 Scott Boulevard. Seven acres, mostly wooded with a focus on native plants, and open to the public. ^ "Race, Black, White, Age, and Housing Occupancy: 2013 Census Redistricting Data (Public Law 94-171) Summary File (QT-PL), Decatur city, Georgia". U.S. Census Bureau, American FactFinder 2. Retrieved October 28, 2011. ^ United States Census Bureau. "Census of Population and Housing". Archived from the original on May 12, 2015. Retrieved August 20, 2013. ^ "American Facts-Community Facts". American FacFinder. U.S. Census. 2010. Archived from the original on December 10, 2014. Retrieved February 12, 2013. ^ Georgia Board of Education[permanent dead link], Retrieved June 8, 2010. ^ "Schools and Centers Archived September 21, 2012, at the Wayback Machine." DeKalb County School District. Retrieved on September 18, 2012. "2652 Lawrenceville Highway Decatur, GA 30033"
^ City of Decatur Schools Archived June 23, 2011, at the Wayback Machine." Retrieved March 15, 2016. ^ School Stats, Retrieved June 8, 2010. ^ Agnes Scott College, Retrieved June 8, 2010. ^ Columbia Theological Seminary, Retrieved June 8, 2010. ^ Emory University, Retrieved June 8, 2010. ^ Georgia Perimeter College, Retrieved April 1, 2013. ^ , Retrieved August 19, 2016. ^ "Library Locations & Hours[permanent dead link]." DeKalb County Public Library. Retrieved on April 11, 2016. ^ City Commission Retrieved March 15, 2016. ^ "Contact." Georgia Department of Juvenile Justice. Retrieved on August 8, 2010. ^ "Official Zoning Map[permanent dead link]." City of Avondale Estates. Retrieved on August 8, 2010. ^ "Directions." Georgia Bureau of Investigation. Retrieved on March 4, 2014. "The GBI Headquarters is located at: 3121 Panthersville Road Decatur GA, 30034"
^ "Post Office Location - DECATUR Archived July 27, 2010, at the Wayback Machine." United States Postal Service. Retrieved on August 8, 2010. ^ "Online Directory: Georgia, USA". Sister Cities International. Archived from the original on April 18, 2008. Retrieved September 28, 2007. Cash, William M.; Howorth, Lucy Somerville, eds. (1977). My Dear Nellie: The Civil War Letters of William L. Nugent to Eleanor Smith Nugent. Jackson: University Press of Mississippi. ISBN 0-87805-036-1. LCCN 77024597. OCLC 3186595. OL 4554869M. Clarke, Caroline McKinney. The story of Decatur, 1823–1899. Dekalb Historical Society (1996). Gay, Mary. Life in Dixie During the War, Mercer University Press (2001). Kaufman, David R. Peachtree Creek: A Natural and Unnatural History of Atlanta's Watershed, University of Georgia Press (2007). Mason, Herman, Jr. African-American Life in DeKalb County, GA, 1823–1970 (Images of America). Arcadia Publishing (1998). Mitchell, Stephens. A Tentative Reconstruction of the Decatur Town Map of 1823, Atlanta Historical Bulletin, No.30, 1965. Owens, Sue Ellen. DeKalb County In Vintage Postcards. DeKalb Historical Society/Arcadia Publishing (2001). Price, Vivian. Historic DeKalb County: An Illustrated History (Georgia Heritage Series). Historical Publishing Network (2007). Willard, Levi. Early History of Decatur.